^ 2.0 2.1 2.2 2.3 2.4 王仲杰,南大西洋的神秘闪光[J]. 《世界知识》,1980,第19期. ^ 5.0 5.1 知远防务. 俄媒体：南非研制放弃核武器始末. 2012年2月17日. ^ 8.0 8.1 沁潜,南大西洋上的神秘闪光：南非秘密研制核武器始末[J]. 《世界军事》,1998,第5期. ^ Jimmy Carter, White House Diary (Norton and Co., 2010), page 405. ^ Rhodes, Richard. Twilight of the Bombs: Recent Challenges, New Dangers, and the Prospects for a World Without Nuclear Weapons. Random House. 2011. ISBN 0-307-38741-0. ^ Weiss, Leonard. 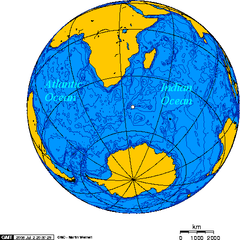 The 1979 South Atlantic Flash: The Case for an Israeli Nuclear Test (PDF). Stanford University. 2011年7月30日. ^ Avner Cohen. Israel and the Bomb. Columbia University Press. 1998年10月15日: 第349頁. ISBN 978-0231104821.